A tasty soup for cold days! Wash and cut as many spring onions as you like in the soup. Cut the sausage in small chunks, heat olive oil in a pan and fry sausage chunks for a few minutes. Add spring onion rings; fry another 1-2 minutes. Add tomato chunks to sausage and pour 500 ml water on it. Let boil for a few minutes, stirring the instant vegetable stock in. Then add pizza herbs, black pepper and a pinch of sugar. Let it cook slowly for about 15 min. 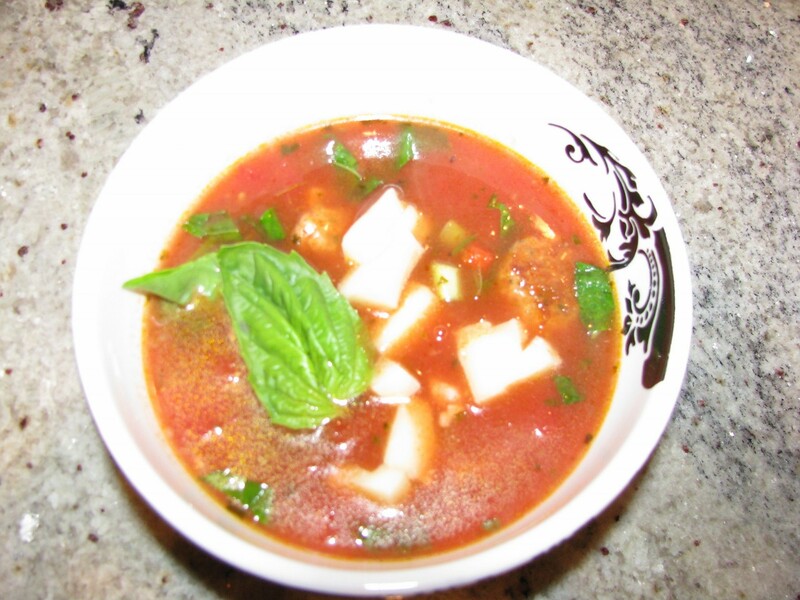 Cut Mozzarella in small chunks and add them before serving the soup. Decorate soup with fresh basil leafs. Serve soup with fresh, warm bread. You can also use “Bocconcinis” instead of fresh Mozzarella. Sometimes they’re easier to find than fresh Mozzarella.